Gold Coast, Australia - August 25, 2014 – STUDIOCOAST, provider of award-winning Live Production and Streaming Software vMix, has announced a partnership with Virtualsetworks, which offers an extensive library of virtual sets. 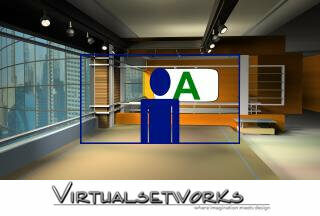 Through this new partnership, customers are now able to browse the Virtualsetworks web site (WWW.VIRTUALSETWORKS.COM) and purchase virtual sets in a vMix compatible format. vMix includes high-quality live chroma key and virtual set capabilities and in the recently announced version 13 now includes support for video mapping and reflections. "Virtualsetworks provides exactly what our customers have been asking for and we’re glad to have them on board as a partner," says vMix developer Martin Sinclair. "vMix has added the most powerful virtual set features for the price of any live production tool, we're happy to support that by creating a version specifically for use with vMix 13," added Eric Pratt, president of Virtualsetworks. vMix pricing starts from $55 USD for Basic HD up to $630 USD for vMix 4K, with all versions including support for virtual sets.